I hope everyone is doing well today, and have found yourself being productive in our Dynamics based world we all live in. I wanted to continue our series today on development with EP, and a focus on our functional scope, around Warranty Management. Last we left off, we had created a new warranty page on our enterprise portal instance. We reviewed the steps of this process, which has its focus primarily on the side of Microsoft Office SharePoint Server - site administration. The idea, for this first focus was around creating a home on EP, in which our functional scope for warranty management will mostly live. In doing this, we selected the default template or style of our page, in which we will come back to later. Having our page created on enterprise portal is the first step for our new scope. Keep in mind, that in some cases for EP development, the functional scope might not drive you in the direction to have a custom page in which to house the new scope on. However, with that said, the purpose of this series is to try and cover as much of EP development as possible, that you could possibly run into. Further, as I stated in the start of this series, it helps to add functional depth to such walk throughs. Lets continue now our focus on this series, by adding navigation so that our warranty page will appear on the EP site. In order to do this, we will need to start by creating a URL menu item within Microsoft Dynamics AX itself. We do this by going to the AOT\Web\Web Menu Items location. In doing this, we will want to create ourselves a web menu item, that points to the URL for our new warranty page. After having done this, we should be able to proceed with testing out our new web menu item, to see if we are pointing to the right location. In doing so we should see a screen shot, similar to the below. Now having done this, we have a couple of options on how to proceed. We could place this as a link on the home page, but instead we want this to be it's own Web Module. We can create a Web module, for our Warranty scope, by now associating the web menu item, into our web modules group, as shown below. You will notice in the above picture, we have placed are new web module, as a sub web module of the out-of-the-box, Home Web Module from the AOT. This will allow us to integrate nicely, our new scope, into the user experience that is expected when using EP for Microsoft Dynamics AX 2012. After doing this step, we can deploy our web module element, by highlighting, and right clicking on the web module itself. For good measure, as well as the same for the Home web module, as it's been updated. A final step, after successfully deploying the web modules, is that an iisreset is required. If you do not do this, your new web module will not be displayed. This makes sense, through the nature of IIS and MOSS, however it's worth noting that it's required. Now that we have deployed, without error, or the customized Home Web module, as well as our new Warranty Management web module, we should then see in our Microsoft Dynamics AX 2012, Enterprise Portal Experience, a similar screen shot to the one below. With this post, we have now created a navigation for our new warranty management scope, and have it deployed to our Enterprise Portal instance. We can now plan for our next steps, which is a focus around AOT management & deployment of the Warranty Home page, as well as start to add functional scope, and specific web functionality for that scope. Well that's all for this post, I hope your enjoying our focus on EP development concepts - and that this is bringing value to your AX investment, no matter when you actually read it! Till Next Time! I hope everyone enjoyed the long weekend. I know I got plenty of Sun, and like always never is long enough. I wanted to start of this weeks blogging focus around, a refresh for the formally known as Business Operations Framework (BOF) - SysOperationsFramework. This makes sense on the name change, because honestly this was only know as BOF in terms of documentation and blogs. If you ever worked with the BOF, you worked with SysOperationsFramework. With this move, the Microsoft content team has released some updates for us. This includes updates to the home for SysOperationsFramework on MSDN, located here. : SysOperation Framework Overview [AX 2012]. Further there is the recently updated whitepaper on this topics as well, which can be found at the following location. : Microsoft Dynamics AX 2012 White Paper: Introduction to the SysOperation Framework. You have seen me in the past, focus a lot on Services in AX 2012, as the focus for all things integration related - inbound & outbound. The SysOperationsFramework is a part of this focus, per it's core design and focus. Further, understanding what all context the SysOperationsFramework impacts, includes items like: FormLetter Framework, Replaces all RunBaseBatch & RunBase, and enables a new focus on possible asynchronous processing options. "The SysOperation framework enables application logic to be written in a way that supports running interactively or via the batch server in Microsoft Dynamics AX 2012. This white paper illustrates how the SysOperation framework can be used to build operations that can run asynchronously and make use of the full processing power available on the server. Four code samples are presented and explained to illustrate the comparison between the SysOperation and the RunBaseBatch framework, and to demonstrate the use of the SysOperation framework in building asynchrouous and scalable operations." That's all for this post, many thanks to Robin and the AX Content team for sending me a heads up on this important-to-note resource updates for SysOperatinsFramework. I suggest following the AX Content team, on twitter from the following handle. : @AXContent. I hope everyone has a productive short week, and keep an eye here this week for some great post. Till Next Time! Well I hope everyone is enjoying this fine spring day. I love spring time, specifically the closer we get to the start of summer. Every year - my family and I always kick off summer on Memorial Day, and share time together with friends and family. Laughing, and just enjoying being together and out in the sun. With that spirit in mind, lets kick off this Enterprise Portal development focus for Microsoft Dynamics AX 2012. Our first focus, should be around the functional design of what we are trying to achieve. This would typically mean, if this was being developed for a customer project, some functional artifacts were created. This would include discovery efforts, functional requirements documents (FRD), functional design documents (FDD) and so forth. Since this focus of this series is around design and development, I think it's important to acknowledge how best to arrive at a solution. All of these artifacts that I have mentioned thus far, comes from SureStep, Microsoft methodology for implementing Microsoft Dynamics - including AX 2012. Now with that stated, it is also typical that Sure Step be understood as a toolbox in which project implementer's and customer's, as well as Microsoft can have a common vocabulary and tool set in which to create project artifacts, communicate design, document the project scope, through support and operating with the help of standard operating procedures. Not to spend to much more time on this point of design, as I could write entirely to much about the process of well executed projects. The point, in short, and so we can get into the meat of this focus - good design is critical. It should focus on the business, it should bring value - and that is the only reason it should be a deliverable. Now there could be a lot more that is done with this, however I believe from the above we can gain a lot of understanding about enterprise portal development, with some functional point to it as well. With that, we will then cover topics of creating pages, creating custom EP forms, using Cue for Role Center pages as well as touch on even workflow for warranty management, and how that works with EP. So the above is the end result, that we are targeting, in having created a custom warranty page, on our EP portal site. Now how did we get there? Well first you have to go to your Enterprise Portal site. From there you need rights to manage the site, and therefore go to site settings, and then more options as we see below. Once we have selected more options, we need to select pages, and then make sure and highlight Web Part page, and continue on with the process. After that we need to select pages, and then select the type of page we care about. We are going to stick with: "Header, Footer, 3 Columns" for the basis page of this solution. Further after selecting the type of page, you need to make sure and name this correctly, as we have named below "idbWarrantyManagement.aspx" and notice we are placing this in the Enterprise Portal Document library. Now that we have created our custom page, the next step is adding it to the EP navigation. We will pick back up on this, and continue forward with our focus on EP development, for our Warranty Management Solution in the next part of this series of post. The next steps we will add this to our EP navigation, and move forward with creating the scope needed that will allow us to have a Warranty Management Solution that gives us the scope we laid out in the start of this post. That's all for today, but check back soon as more to come, including a continued dive into BI, spotlight post, book review, and of course our continued dive into EP design and development for AX 2012!Till Next Time! I hope everyone is doing well, and into the Dynamics World, on this fine Tuesday. We will continue our focus on EP tomorrow, but today, I wanted to spend a little time and write about a specific issue when using the Excel Add-in for Microsoft Dynamics AX 2012. What I'm talking about, can happen in a few different possibilities. Specifically however, and more to the direct error message. If you have Failed records when using the Excel add-in and the error message for each record is very generic, you should then move towards looking at the Application Event Log, where the Excel Add-in is being executed. Within the Application Log, you will most likely see an RPC Exception 1702 or 1700 or 1704. Now the Excel Add-in is suppose to be connecting and communicating through WCF protocol for the Query Service, and other such services? Why RPC? Well there is a part of the .Net BC still used, from what I've found - needs clarification - with this process. So how do we reach this error? Well most likely something has changed about a table your trying to access, or a Data, ie: Query or Service, that your trying to consume. For example you might have added a new import staging table to your instance, saw it fine in the Add Data, Add Tables list. However now that you go to publish the data, from which you have built the excel table with - all records fail? This is a sign, that a Full CIL needs to be executed on the target instance in which the Excel Add-in is pointing to. This has been the fix for such issues, I've come across - every single time! In short, running into errors with the Excel Add-in, specifically RPC errors in the Application Event log, then perform a full CIL compile on the target instance. Doing so should get you past such issues, and should allow you to proceed using Excel Add-in and your changed or new table - for loading data. That's all for right now, I will leave you with a link to the past post I did about the Excel add-in. : AX 2012 - Excel Add-in Revisited. We will continue the EP and BI paths, as well as I have a slew of highlights, book reviews, and spotlight post coming soon. Along with a new interview from a Microsoft Executive, to help close out FY12 for Microsoft. So check back soon, and often. Till Next Time! Well I hope everyone has had a great weekend and your looking forward to another Dynamics AX filled week. There is so much to cover about this powerful release of Microsoft Dynamics AX, with AX 2012. I'm really looking forward to our continued path down creating a BI story with AX 2012. Further, I'm equally as excited to have started the EP focused development post. There we will be targeting a warranty management solution, built 100% for EP. With that said, and going back to the fact that we have so many wonderful topics to touch on with AX 2012 - I wanted to do a blog spotlight. It's been a little while since I have done such a post, and I wanted to take the time and highlight what Eduardo Arias, of AXWonders.blogspot.com recently posted about. "Application Triggers are called before and after certain operations when the Microsoft Dynamics AX 2012 POS application is running. This is the first assembly that AX 2012 POS looks at when starting. In addition, you can override the default Application Triggers’ operations by using the IApplicationTrigger interface provided by the Microsoft.Dynamics.Retail.Pos.Contracts.Triggers namespace in Visual Studio 2010." Ed takes us through, in his first on a series about Microsoft Dynamics AX 2012 POS Development, and dives into the topic of Application Triggers. In this Ed takes us the design, interfaces & steps - so that we can gain a very solid knowledge base around AX 2012 POS and Application Triggers. Further, as we read along we are giving insight into the process, where to find examples, as well as a look to the next in this series of post. 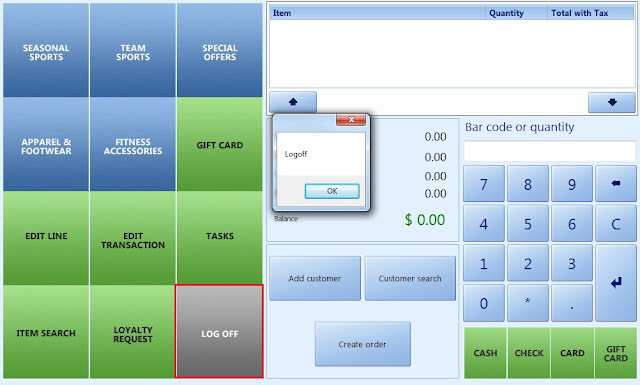 That being a focus around the topic of Blank Operations for AX 2012 POS Development. All-in-all it was a great start to a very interesting subject. I think it's a very timely entry into the blogsphere, and as Ed points out - there is not a lot of coverage for this topic yet. With that, many thanks Ed for adding to the community, and please keep it coming! I hope everyone is doing well this Friday! I wanted to spend just a little time this morning, to post and setup one of the next series of articles I will be focusing on. With the release of Microsoft Dynamics AX 2012, Enterprise Portal became a First Class Citizen client for the solution. It has a similar look and feel to Office as well as the Rich client, which helps create a unified user experience across the entire solution. With this understanding, I wanted to start a series on Enterprise Portal Development, that will go along and merge with the focus I've had recently on Business Intelligence. The two will cross, as we move into Team based BI and Organizational BI. The above list gives some pretty good information on the common task that take place around the development processes and common task for EP development. This includes creating custom pages, custom forms, and even using workflow with EP! My plan around this series, is to make sure to reference into this resource pages, but also take and add value around it. Having screen shots, food for thought, and any gotcha's and planning points that you need to look at. With this in mind, I wanted to reference back as well to what I lasted posted about for Enterprise Portal Page Interaction Patterns. We need to keep this in mind, around the design for EP focused development. In order to help start this focus around EP development for an instance of AX 2012 then, lets target our first focus, for what we will develop. With that in mind, lets start with the first page interaction design pattern of View & Edit interaction pattern. We also need a functional scope that we are trying to achieve with this, to have some meat to this series, similar to what I've done so far with the personal BI series, with a focus on Customer Aging & PowerPivot. With that, lets focus on creating a basic Warranty Management solution for AX 2012 that is 100% focused for Enterprise Portal as it's target. Well that's all for this Friday, I hope that everyone has a great weekend and your excited about diving into EP. Keep checking back as we continue our focus on BI, Development, Book Reviews, interviews and more for Dynamics AX and Dynamics in general! I will leave you with one more resource, which is the what's new for Enterprise Portal for AX 2012.: What's New: Enterprise Portal in Microsoft Dynamics AX 2012 [AX 2012]. Till Next Time! I hope everyone is doing good on this Wednesday! I wanted to write, and point out a great resource on Microsoft's MSDN that focus on AX 2012 - EP Page Interaction Patterns. This is a great resource for understanding the UX for EP, and the intended page interaction patterns set forth by Microsoft. When creating new pages, and extending a customers instance via Enterprise Portal, it is very important to have the same look and feel as the rest of EP. "The page types in Enterprise Portal work together to provide a consistent experience for the user. Some of the pages are displayed in the main browser window, although other pages are displayed in modal dialogs. The following diagrams describe the page interaction patterns for several common scenarios in Enterprise Portal. " The page goes into walk through's that cover the six different page interaction patterns: View and Edit, Direct Edit, Edit with Additional Details, View and Edit Details, Two-phase Create and Create and submit to Workflow. What I really want you to take away from this highlight post on this resource is two main points. The first being that of the resource itself so that you can become familiar with the desired page interaction types for EP. This is critical to understand to have valid design artifacts for projects and creating correct deliverable's and user experiences. The Second point, is tied directly back to those design artifacts for projects. The page interaction type, and therefore this resource page, should be referenced in the design - as well as understood from the functional design point-of-view. Since the role and workload needs to be considered for the design of the deliverable, the page interaction type for such scope should be something that is determined early on. This is why I think it's very important to understand these page interaction types. It has to be understood, and apart of the design process so that the custom scope that is being delivered fits into the rest of EP for AX 2012. I can't stress this point enough! Well that's all for this post, but check back soon as I have up-coming book reviews, more on EP design and development, continued BI, and a whole lot more around AX 2012! Till Next Time!